NOTICE: Activation key must be used on a valid Steam account, requires internet connection. 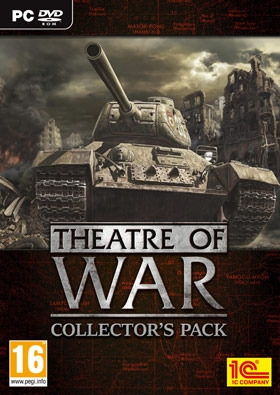 ABOUT THE GAME	Theatre of War: Collection Theatre of War (English) Theatre of War 2 : Africa 1943 (English) Theatre of War 2 : Centauro , DLC to Africa ( English) Theatre of War 2 : Kursk 1943 (English, German) Theatre of War 2 : Battle for Caen, DLC to Kursk (English, German) Theatre of War 3 : … Korea (English, German)SYSTEM REQUIREMENTS Minimum: Operating System: Windows XP or Vista Processor: Intel Core 2 Duo or AMD Phenom II (2.4GHz or better) Memory: 2 GB Video card: NVIDIA GF 7600 or AMD Radeon HD 2000 series with at least 256MB RAM and Shaders 3.0 support Sound card: DirectX 9-compatible Hard disc: 8 GB free hard disk space CD ROM: PC DVD-ROM Recommended: Operating System: 64-bit Windows Vista or Windows 7 (Works on Win8) Processor: Intel Core i7, i5 or AMD Phenom II (3GHz or better) Memory: 4GB Video card: NVIDIA GF 8800 or AMD Radeon HD 4850 with 512MB RAM or better Sound card: DirectX 9-compatible Hard disc: 8 GB free hard disk space CD ROM: PC DVD-ROM	© SoftClub IP Management Inc., 2007-2012. All rights reserved. Uses SpeedTree®RT technology (© 2002-2011 Interactive Data Visualization, Inc.). SpeedTree® is a registered trademark of Interactive Data Visualization, Inc. All rights reserved.